Teri (Sanden) Starkey has Cystic Fibrosis - a genetic lung disease that has an average lifespan of 35. As Teri's lung health is declining, she us nearing the inevitable reality of needing a double lung transplant. Teri and her family, Eric and two young children need your help as they are forced to up-root their life to move to North Carolina where she will continue her care and prepare for a future transplant at Duke University Hospital. 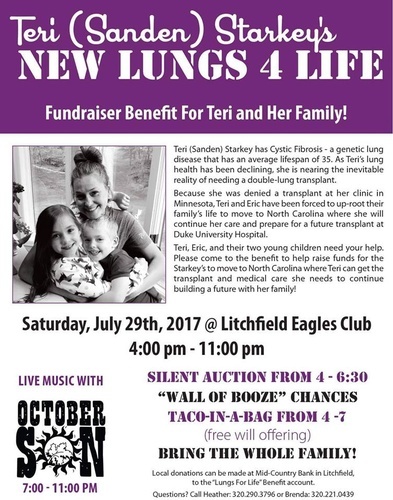 Come, Help & Support Teri and her family! Bring the Family! Live Music! Silent Auction!